The Indesit IDVL75BR 7kg Tumble Dryer is designed to take excellent care of your clothes with its 3-level sensor drying system. It gives you the choice between iron dry, cupboard dry and ready to wear so you can select the exact level of dryness you need and it’ll automatically stop when that’s reached. 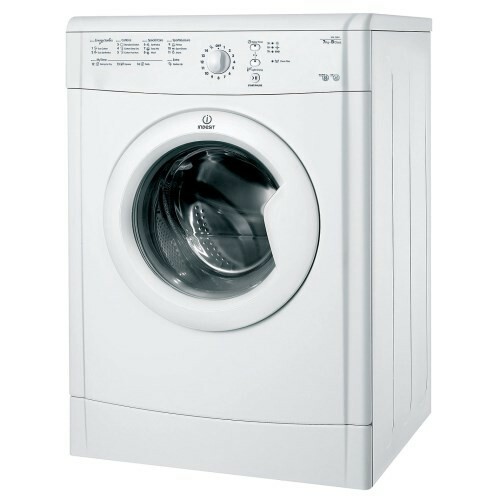 The IDVL75BR tumble dryer features an Energy Saver cycle. This has been designed to help you save further on small loads. Thanks to the electronic sensor, it can measure the exact level of residual moisture, control the temperature and conductivity allowing you to save on energy and time. Perfect for drying off shoes, this innovative tumble dryer has integrated a shoe rack. This unique accessory positions your shoes vertically for the hot air flow to penetrate inside and dry thoroughly. The Anti-Tangle rotation motion dries your clothes easily and reduces tangles, meaning your washing will have fewer creases and greater satisfying results. With 7kg of capacity there is plenty of room for your washing to dry.